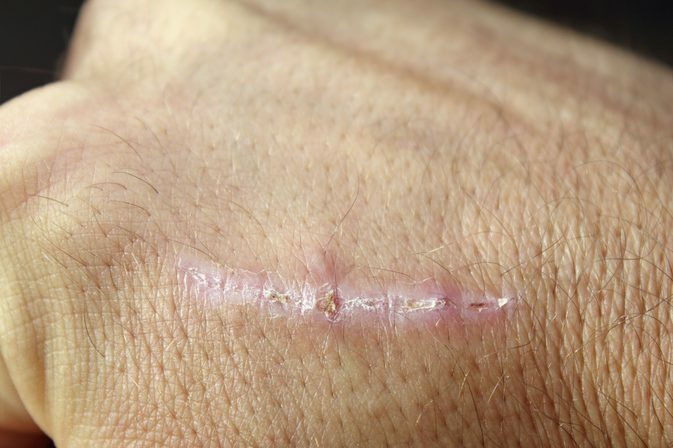 Because your skin is your body’s largest organ, it is prone to injury. Injuries from disease or trauma, such as acne and cuts, prompt a healing process that includes scarring. As new skin grows over the wound, inflammation or reddening can remain for months. Combat redness with a few drugstore remedies. Apply an over-the-counter mild steroid cream to reduce redness. Use hydrocortisone cream, which can lessen the redness by healing the damaged blood vessels under your skin. Read and follow the directions on the packaging for best results. Apply pure aloe vera gel directly to reddened scars. Aloe vera contains potent anti-inflammatory compounds that can reduce irritation and redness. Choose only pure aloe vera gel, found at health food stores, and avoid aloe vera gels that contain alcohol or other irritating chemical additives. Use a silicone gel, purchased at drugstores, to reduce redness. Use it sparingly to gradually fade away acne scars and reduce discoloration and redness. Apply sunscreen to scars before going outdoors, because fresh scars can easily burn and redden when exposed to sunlight. Apply sunscreen 30 minutes before going outdoors. Consult your physician before using remedies to treat serious wounds.